Everyone who has at some time taken up a reading of Seminar XI will be familiar with the story of Choang-tsu included in it, a reference that contributed to the view of Lacan as a kind of Zen Master. To remind you, the story that Lacan recalls for his audience concerns a man, the aforementioned Choang-tsu, who falls asleep and dreams that he is a butterfly and who, upon waking, wonders whether perhaps he is a butterfly who is only dreaming that he is Choang-tsu. Despite the apparent absurdity of this fleeting thought, Lacan says it is enough for us to be able to infer from it that Choang-tsu is not mad – and this because it testifies to the incompleteness of this subject’s identification with ‘Choang-tsu’, that ‘Choang-tsu’ does not cover all that he is. And it is this seed of doubt, planted in the beat of time between the opening and closing of a butterfly’s wings, a dreamer’s eyelids, and the fleeting space which it wedges open, that prevents the cascade towards a ‘Return to Schreber’. While this little story might be taken up as just one more useful reference in orientating our practice, its appearance here serves rather to underline the danger inherent to any discourse closed onto itself, one which only makes its ever-ready ears available to its own ‘little voices’. It’s remarkable really that Lacan’s comments made in the early Sixties – that, when dreaming, he is a butterfly for nobody while it is whilst he is awake that he is Choang-tsu for others and truly caught up in their butterfly net – are not more readily taken on board today in a world in which we are more than ever the prey of the various networks … the networks of radio, television, internet and mobile- (cell-) phone. This issue of THE LETTER hopefully will serve in some small measure as a space given over to projects that have attempted to be part of something different, attempts at the introduction of something new into a discursive field. The first of these projects concerns a very real Orientation rendering the story of Choang-tsu all the more apt: one could say that Choang-tsu goes home. So, as summer draws to a close, we present firstly a group of papers delivered in China earlier this year. 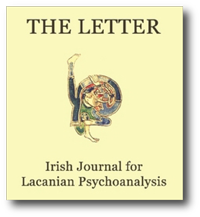 Introduced by a comprehensive report by Cormac Gallagher, the three papers which follow represent the work of a number of the European contributors (Dany Nobus, Gérard Pommier, Erik Porge) to an international psychoanalytic conference in Beijing, each of which pays special attention to the relation which Freud and later Lacan held to exist between the Unconscious and writing, and especially when the script in question is Chinese. We would hope to be able to bring a number of the other contributors’ works to you in the near future. Secondly, we bring you a selection of papers based on presentations made during the Clinical Series 2000-2001, organised by the Association for Psychoanalysis and Psychotherapy in Ireland, for which DBS College through the Centre for Psychoanalytic Studies provided the venue. Regular readers will already be familiar with these authors (Paul Verhaeghe, Olga Cox-Cameron, André Michels) through our publication. Again, we hope to bring you more of the contributions to that first series in future issues. By the time this issue reaches you the Clinical Series for the year 2001-2002 will have been launched, its aim being to continue the project which the organisers set themselves at the outset – simply put: to advance Freudian and Lacanian psychoanalysis. The first sessions of the series will be devoted to the relation between the fields of psychoanalysis and psychiatry and serve as preliminaries to a related section of the annual APPI congress to be held in November and which, I hardly need remind you, will be dedicated to The Legacy of Jacques Lacan as a celebration of the centenary of his birth. Coincidently, as you will read in Cormac Gallagher’s text, the actual date of Lacan’s centenary, the 13th April 2001, saw the eve of the opening of the Chinese congress which, incidentally, was born of an invitation from a psychiatric unit to a psychoanalyst. They’re far from mad, the Chinese.